US President Donald Trump has vowed that his administration will continue to isolate Iran through US sanctions that are being re-instated following the US withdrawal from the landmark 2015 nuclear agreement. Furthermore, hawkish US National Security Adviser John Bolton warned that there will be “hell to pay” if Iran continues on its current course. The policy statements by the three US officials while attending discussions at the UN General Assembly in New York last week, together with the disclosure that the Trump administration is pressing ahead with plans to create an “Arab NATO” that would unite US regional partners in an anti-Iran military alliance, were further signs of escalation in the Middle East. Fifteen years after the US invaded Iraq, Trump seems to be inching Washington closer to a fight with Iran that could have profound consequences for the Middle East, the Gulf region and probably beyond. But with Iraq’s next-door neighbouring Iran, any US-Iranian confrontation could bring more agony to the country’s dysfunctional political system and promote deep instability in the beleaguered country. As a result, the US strategy of applying maximum pressure on Iran may represent one of the greatest challenges to Iraq and carries the risk of escalation in the ethnically and sect-divided country. Tensions began to build in May when the Trump administration backed out of the Iran nuclear deal, even though other leading nations and the International Atomic Energy Agency (IAEA) had verified that Iran was in full compliance with it. In August, the Trump administration re-instated a first set of US sanctions on Iran that had been suspended under the nuclear deal, known as the Joint Comprehensive Plan of Action (JCPOA). However, the bulk of the US embargo on Tehran will not come into force until 5 November, 180 days after Trump’s initial 8 May announcement that Washington would withdraw from the agreement. On that date, all of the US sanctions suspended after the JCPOA was signed will be re-instated, including the most important in the shape of the ban on Iran’s oil exports. For months, the looming sanctions and the expected rise in tensions have put Iraq in a particularly awkward position as it regards the two rival countries that are its major partners in the war against the Islamic State (IS) terror group. The United States continues to provide significant levels of aid to the Iraqi security forces that are shaping the US-Iraqi military relationship. Washington is also believed to be maintaining a large force of an estimated 7,000 security personnel in Iraq. Meanwhile, Iran, which has long been entrenched in Iraq, has maintained a significant interest in Iraq, acting as a hegemonic power in the country and taking up the role of both a major political actor and providing support to the country’s Shia militias. Iran is also Iraq’s second-largest trading partner after Turkey, supplying Iraq with everything from gas to electricity and fruit and vegetables. The two countries share a 1,200 km border. While some of Tehran’s trading partners appear to have succumbed to US pressure, Iraq has yet to decide whether to comply with the sanctions or to sidestep the unilateral move. Outgoing Iraqi Prime Minister Haider Al-Abadi had initially said he would honour the US sanctions, but on 28 August he called them “unilateral” and “oppressive” after he came under fire from pro-Iran groups in Iraq. The dominant Shia political groups in Iraq have criticised the re-imposition of the sanctions on Iran and have forced Al-Abadi to declare that Iraq will only restrict dealings in US dollars with Iran while trying to seek exemptions from some of the sanctions. The Trump administration has warned that countries that continue to do business with Iran, including allies in Europe and the Middle East, could face penalties under the sanctions. Washington’s escalation of its rhetoric against Tehran also comes amidst a government crisis in Baghdad following the inconclusive May elections. Both pro-Iran groups and their political rivals are jockeying to form the next government. 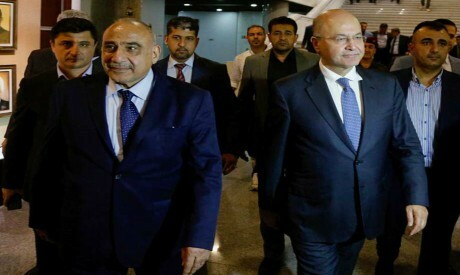 Iraq’s new parliament elected veteran Kurdish politician Barham Salih a president on 2 October after months of political deadlock, with 219 of its 329 lawmakers voting for him. Pompeo underscored last week that Washington was working to ensure that the formation of the new government would be outside Iranian influence. On the ground, Washington has begun increasing the pressure on Iran and its proxies in Iraq. It has employed a range of policy tools in recent days to influence Iraq’s domestic situation notably by undermining elements of the Iranian influence in Iraq. “We are going to closely watch who occupies positions of responsibility and evaluate them closely,” the official was quoted as saying. He warned that Washington would not be able to continue the level of support and assistance it is currently providing if those that hold strong and enduring relationships with Iran make it into the new government. In a bid to reduce Iran’s influence in Iraq, the US Congress’s Foreign Affairs Committee voted on 27 September to pass bipartisan legislation that would block the assets of Iranians found to pose a threat of violence in Iraq. Another bill to sanction two Iran-backed Shia militias is in the making. A key step in raising the tension came on Friday when Washington disclosed plans to forge a military and political alliance between the US and six Gulf Arab states and Egypt and Jordan to counter Iran’s influence in the region. Taken together, it is clear that the Trump administration is shaping a narrative about Iran’s growing threats to US interests in Iraq in a light favourable to escalating the dispute as part of its strategy to contain and counter Tehran’s influence in Iraq. Watching the escalation one might conclude that a larger US-Iranian conflict and possibly a major confrontation raging in Iraq itself is only a matter of time. Given Iraq’s precarious status, the US-Iranian conflict could augur full-on sectarian strife in Iraq. Indeed, the risk that the dispute might cause a serious rift within Iraq has already began haunting the country. Many analysts believe that a military engagement between US troops and Iran’s proxies in Iraq could inflame the situation in the country, which will remain combustible even after rival political and sectarian factions succeed in putting a new government in place. Formulating an effective response to Washington’s belligerence towards Iran will be challenging to the new Iraqi leadership. Its other daunting challenge is how to navigate in order to limit Iran’s influence in Iraq. In order to do so, Iraq’s new government should consider broad policy points that would counter efforts to turn Iraq into a battlefield between Iran and the US, which are competing for control and influence and to settle old scores in Iraq. The major question is no longer how much Iraq stands to lose from the US-Iranian confrontation. It is rather whether the Iraqi political groups have the political will and strategic vision to oppose both US and Iranian pressure to make Iraq their playground. * A version of this article appears in print in the 4 October, 2018 edition of Al-Ahram Weekly under the headline: How will US-Iran standoff impact Iraq?